Morning in Baños began with something I’d never encountered in a hostel before: a made to order breakfast. Yes, the staff at the lovely Hostal Transilvania (the name remains a mystery to me) greeted us with the choice of eggs any way or pancakes. I went with eggs, scrambled (as that was the only egg prep word I knew in Spanish), and the boys had pancakes. Not bad for a place that set us back less than ten dollars each for the night. 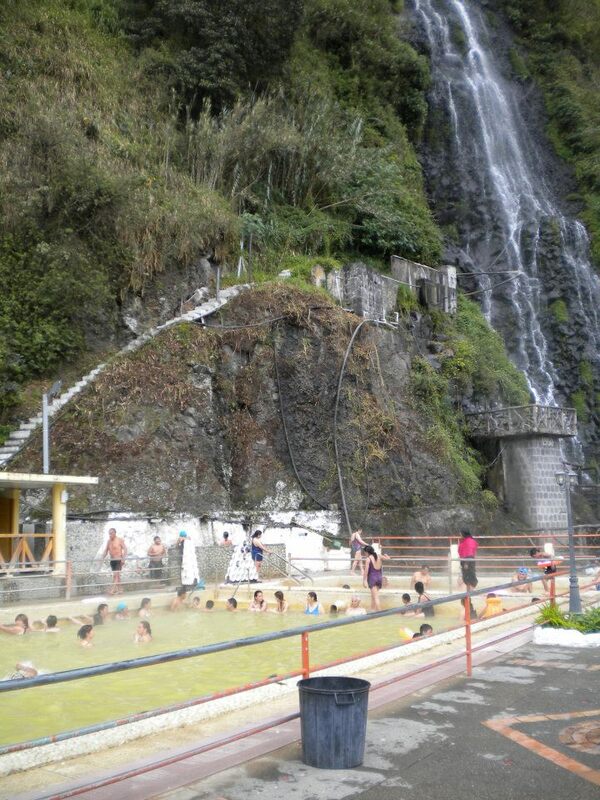 After breakfast we headed out to see where Baños got its name: Las Piscinas de la Virgen, allegedly the most popular thermal baths in town, located at the base of the Virgin’s Hair waterfall. There were three pools in the facility to choose from: cold (didn’t bother trying), warm (the most popular of the bunch) and hot (only able to stand it for a few minutes at a time). We bobbed around in the pools for a while, taking in our lovely surroundings and chatting about the day to come. I told myself to remember this moment in a week’s time, when I would be back at my desk, sorting through an inbox full of emails. Tossing those thoughts aside, I focused on enjoying my time in the thermal baths, surrounded by beautiful mountains and waterfalls, in Baños, Ecuador. Pretty cool. Following the baths we headed back to the hostel for a shower (despite being called baths, the water doesn’t leave one feeling clean) and were on the road by 10:40am. 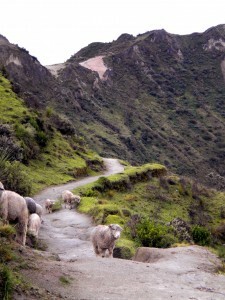 We had booked an apartment in Quito for the evening, so we knew our final destination. 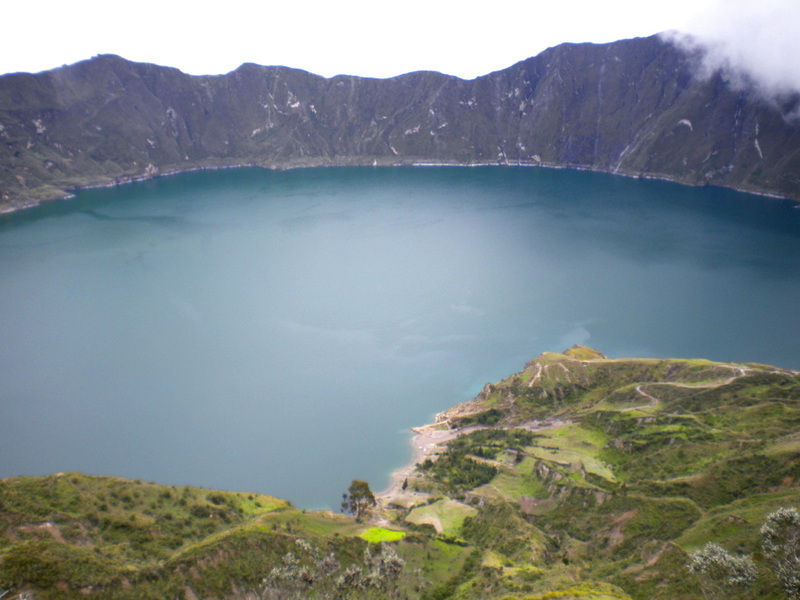 On the way there, however, we planned to stop at Laguna Quilotoa, a lake that had formed in an extinct volcano. It was a bit off the beaten path, and it took two hours to get there, largely due to the unfinished, winding mountain roads. Along the way we stopped for lunch in Zumbahua, a small mountain town where we ordered three heaping plates of potato, lentils, rice and beef, along with a huge water jug and coke. Total price: seven dollars. Cheap meal award goes to Zumbahua. The food was basic but tasty enough. Later on, though, all three of us complained of minor bellyaches. On to the lake! We parked close to the rim and walked a bit farther to get a good view. What a site! 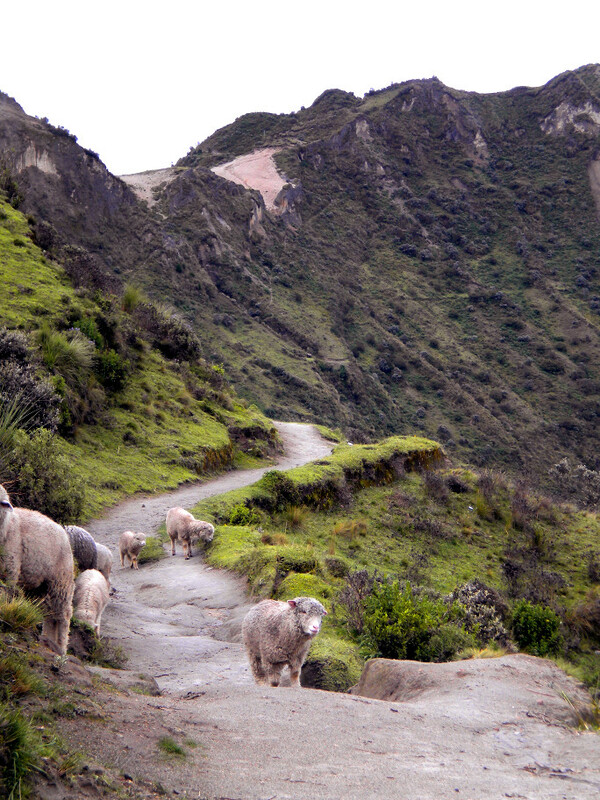 As we admired the scenery a couple of locals passed us by on their way to who knows where in the mountains. We couldn’t see where the path led, and they may as well have been walking into another world. Moments later, a young sheepherder who couldn’t have been more than 7 or 8 years old impressed us by flying down the steep mountainside after his animals without the slightest hesitation or fear. My biggest concern at age 7 was whether or not I’d make it home from school in time to catch my favorite cartoon, a far cry from keeping track of livestock on my own, on the side of a cliff. We marveled at his fearlessness and independence – what a different life. It was hard to imagine daily life in a mountain village like this, so far removed from the rest of the world. Again, the poverty was evident and the mud and dirt that composed the streets left everyone looking a bit worse for wear. Similar to what we’d seen in the jungle a couple of days before, this was another example of the juxtaposition between the state of human existence and the spectacular scenery in which they existed. 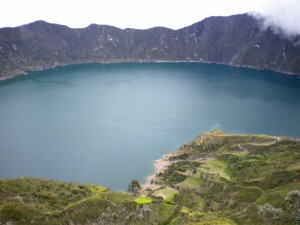 After the lake, we headed out to Quito, arriving around 7pm – later than planned once again (we should just always expect to be late). Finding our apartment wasn’t too difficult, and after dropping off our things we hit up a restaurant called Vista Hermosa for dinner. True to name, the view was in fact gorgeous. The food, however, was only mediocre, and the prices reminded us that we were now in the big city. After dinner we took a taxi back to the house and hit the hay early. Everyone was pretty shot.